A full description of the Cotlook A Index can be found here. Generic name for a synthetic fibre consisting of at least 85% of acrylonitrile units. The name given to the francophone cotton producing states of western and central Africa. They include, in order of prominence with regard to raw cotton production, Mali, Benin, Cote d’Ivoire, Cameroon, Burkina Faso and Chad. All have a common currency, the CFA franc, which is linked to the French franc. Currently the second largest of the South American producing countries. The major cotton growing provinces are the Chaco and Santiago del Estero. Amongst the top ten of the world’s cotton producers, the major cotton growing areas include the Macquarie, Namoi and Gwydir valleys in New South Wales, and Emerald and the Darling Downs in Queensland. National bale weight is given as 227 kilos. A basic tradeable unit of lint (ginned cotton). Bale weights vary from country to country. (See under the relevant country for specific bale weights were applicable.) By convention, a ‘statistical’ bale weighs 480 lbs. One who anticipates a decline in prices. Opposite of “bull”. Linters that have been bleached ready for further processing. The fruiting structure of a cotton plant. It is made up of separate compartments called locks, in which cotton seeds and lint grow. The largest of the South American cotton producing countries. Growth in area planted to cotton in the centre-west region in particular has been significant in recent seasons. Annual raw cotton consumption is currently estimated at around 660,000 tonnes. An alternative name for open-end spinning. One who assembles individual bales or small lots into larger volumes for others. One who acts as a selling agent for shippers/growers and buyers for mills. A genetically engineered cotton carrying the Bacillus thuringiensis (Bt) gene that produces, in every cotton plant cell, protein crystals toxic to some insect pests. Gives the purchaser the right to buy the underlying futures contract at the strike price up to expiration. A yarn preparation. During the carding process raw cotton is separated, opened, cleaned and made into sliver. The seller is responsible for payment of costs and freight necessary to bring the goods to the named port of destination. The risk (loss or damage to goods), together with any additional costs incurred after loading becomes the buyer’s once the goods pass the ship’s rail at the port of shipment. Current the world’s second largest producer of raw cotton. In recent years a major import market. Term of sale signifying that the price invoiced or quoted by a seller includes insurance and all other charges up to the named port of destiniation. The body resonsible for recording all futures transactions at an exchange. also the guarantor of all options. the degree of whiteness of the cotton fibre. describes the colour of cotton lint. There are 30 standard colour grades, of which 15 are physical standards (held as boxed samples of the complete range of grades) and 15 are descriptive. An industrial yarn preparation. During the combing process, fibres are combed to make them parallel in the sliver and short fibres are removed. A system of spinning in which the fibre moves through the process without interruption, eg ring-spinning. agreement between two or more parties to buy or sell commodity, security, currency or index. A full description of the Cotlook Indices can be found here. The process originally developed for spinning cotton, applied now also to other staple fibres. A number indicating the mass per unit length or the length per unit mass of yarn. Damage to cotton caused by moisture, dust or sand affecting bales that have either been exposed to the weather or stored on wet or contaminated ground. An extreme form of immature cotton, having a thin fibre wall. Can result from disease, pest attack or a foreshortened ripening period. weight of a man-made fibre or yarn, expressed as the weight in grams of 9,000 meters of the thread. The lower the number, the finer the thread. reduction in price from the base rate in order to purchase a lower grade. cotton grown using mainly water provided by the natural cycle of rainfall rather than artificial irrigation. Also known as dryland cotton. An indirect system measuring length per unit of mass, ie. The number of hanks (840 yards) per pound weight. A cotton fibre is classified in four ways, by its length, micronaire, strength and uniformity. (See also length, micronaire, strengthand uniformity). The fibre typically accounts for approximately 35 percent of the weight of a seed cotton, though this proportion varies. A shipping term which indicates that the supplier pays the shipping costs, and is usually also responsible for insurance costs. Costs relate to those incurred from the point of manufacture to a specified destination. Costs beyond this point are the responsibility of the buyer. Anything that is not part of the cotton plant. Asiatic short staple coarse cotton, usually of high Micronaire. Pima or extra long staple cotton. Major producing countries are Egypt, the USA, Israel, Peru and the Central Asian staes of the former Soviet Union. Typically known as upland cotton of medium staple length. It is the major species of cotton grown worldwide, accounting for about 90 percent of planted acreage. the ratio of lint to seed cotton produced by the ginning process. Official US classification system given to lint to describe its quality in terms of colour and leaf content. See Universal Cotton Standards, colour, leaf. A middle-ranking producer and exporter of cotton. Production is subsidised by the European Union. The balancing of operations in spot cotton, or related products, with offsetting operations in cotton futures, to reduce the risk of loss through price change during the period of merchandising or manufacturing. High Volume Instrument testing. Systems by which high speed bale by bale testing can be attained. Bales are tested for micronaire, length, uniformity, strength, elongation, colourand trash content. The ICE Futures US (including what was formerly known as the New York Board of Trade) was founded by cotton brokers and merchants in 1870. It is the oldest futures exchange in New York. (See Also futures contracts, long). The largest producer of raw cotton. The major producing states are Gujarat, Punjab, Haryana, Rajasthan, Maharashtra, Madhya Pradesh, Andhra Pradesh and Tamil Nadu. The bulk of output is consumed domestically. A coarse, brown fibre from the stalk of a bast plant. Central Asian producing Republic. Cotton is sold by auction at the Stock Exchanges in Alma-Aty and Shimkent. describes the leaf or “trash” content of cotton lint. There are 8 grades, of which 7 are physical (held as boxed samples covering the range of grades) and the remaining is a descriptive standard based on the other 7. The average length of cotton fibre after the ginning process. An indirect system measuring length per unit of mass, ie. The number of kilometres per 1/2 kilogramme. The size of an individual cotton fibre taken in cross-section. Can be either fuzzy (immature seeds on which fibre development ceased at an early stage) or bearded (a piece of seed coat with long fibres attached). Both are often termed seed coat neps. A process by which yarn is spun from a broken-up sliver or roving. The process of separating fibres from the pressed bale. Under the terms of an option contract, a buyer has the right to buy or sell a futures (or other) contract, at a specific price within a set period of time. The contract price is not dependent on the current market price for the contract item. The buyer is under no obligation to fulfil the contract. Organically grown cotton uses crop rotation, beneficial insects, compost and other farming methods in place of chemical fertilisers and intensive farming techniques. Fourth largest producer of raw cotton. The major producing states are the Punjab and Sind. Generic name for a synthetic fibre made from polyethylene terephthalate. An amount by which a price is increased in order to buy a product of a higher grade or quality. Gives the purchaser the right to sell the underlying futures contract at the strike price up to expiration. see also discount and premium. crop that is cut back or cropped and is left to grow again for another season. A man-made fibre made from regenerated cellulose. Reginned cotton is cotton that has passed through the ginning process more than once, and has also already been baled. It may go through the ginning again for additional cleaning, blending or the removal of foreign material. A system of continuous spinning of staple fibre. Fine, long staple cotton grown in the West Indies. Someone who has sold cotton futures or other contracts is said to be short until he buys the contracts back or delivers the cotton at the maturity date of the contract. Describes the ply of yarn. A single is the most popular ply and means , raw cotton twisted into a single thread. A modest producer of cotton, mainly irrigated. Qualifies for EU subsidies. Reported prices for all specific quality designations on a certain trading day. Yarn spun from staple fibre held together by twist. prices : firmness or steadiness fibre : power of the fibre to sustain the application of force (as applied in spinning) without breaking. The price specified in the option contract at which the futures or commodity will move from seller to buyer. A producer of G. barbadense (Barakat) and upland (Acala) cottons, mostly on major irrigation schemes. Fibres or filaments produced from polymers. Not naturally occurring. The third largest Central Asian producing Republic of the former Soviet Union after Uzbekistan and Turkmenistan. The weight of wrapping bands or wires used to cover cotton bales. The attempt to forecast future market action on the basis of past price behaviour. The underlying assumptions are that price fluctuations are not strictly independant and that certain chart formations tend to correlate with subsequent price direction. (grams per kilometre) A direct decimal count system for describing the linear density (mass per unit length) of fibres, filaments and yarns. The lower the number, the finer the thread. the leaf content of ginned lint. Major producer, consumer and importer of raw cotton. Production is forecast to expand over the coming years, as more land in the south east of the country is irrigated. The second largest Central Asian producing Republic of the former Soviet Union after Uzbekistan. The degree to which the fibres in a sample are uniform based on the ration of mean length to the upper half mean length. Given as a percentage. Current the third largest producer of raw cotton in the world, and customarily the largest exporter. Refers to American Upland Cotton. Established in 1924 as an aid to promoting domestic and foreign trade. Recognised by 18 countries in Europe, South America and Asia. Originally used to refer to cotton grown on raised lands not prone to flooding. Now refers to short and medium staple cottons. The largest of the Central Asian producing republics of the former Soviet Union, and one of the world’s largest exporters. A man-made fibre spun from regenerated cellulosic material. Threads which run parallel to the loom. The manufacturing of cloth by the interlacing of yarns. Threads which run at right angles to the warp. Worsted yarns are made from long fibers of 3 to 6 inches, which are combed to lie parallel to each other, producing a smooth, clean look. They are usually fine, tightly twisted ply yarns. 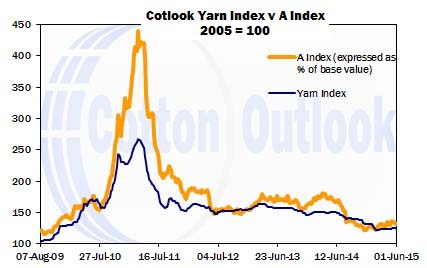 The Cotlook Yarn Index is derived from our published FOB prices for 20s and 30s counts from India, Pakistan, Indonesia, China and Turkey, each weighted to reflect exports of cotton yarn from the individual country concerned, and expressing that as a percentage of the comparable average values for 2005. In determining the weightings, we use an average of the exports in the two most recent calendar years for which complete data are available. cotton yarn is measured by yarn number, based on how many hanks (840 yards) there are in 1 lb of yarn. The higher the number the finer the thread. Zhengzhou Commodities Exchange was established in 1990 and is regulated by the China Securities Regulatory Commission. A cotton futures contract was introduced in 2006, and has become a highly-used, speculative and hedging device in the China domestic market.